In this post I’ll show you how to create your very own blog in just a few minutes. Creating your own blog can benefit you in many ways, such as creating a professional image for yourself, sharing your ideas and knowledge with the world, expanding your network and connections, helping others, making money by turning your blog into a business, and many other benefits! My favorite part about blogging is being able to make money by writing and creating content on topics that interest me. You can make a lot of money from blogging and owning a blog! It’s easy to set up and create your own blog, and I’ll explain how to create a blog for only a few bucks a month. As a bonus, I was able to work with Bluehost to get you special discounted pricing to make creating your own blog as cheap as possible. You’ll be able to get special pricing and a free website domain name that are only available through my links in this post. I can’t guarantee how long this special pricing will last, so act fast! The easiest and most popular way to create a blog is by using the WordPress platform, which is the world’s largest blogging platform. Using WordPress is the best way to create any type of website or blog and allows bloggers access to their complete content management system. 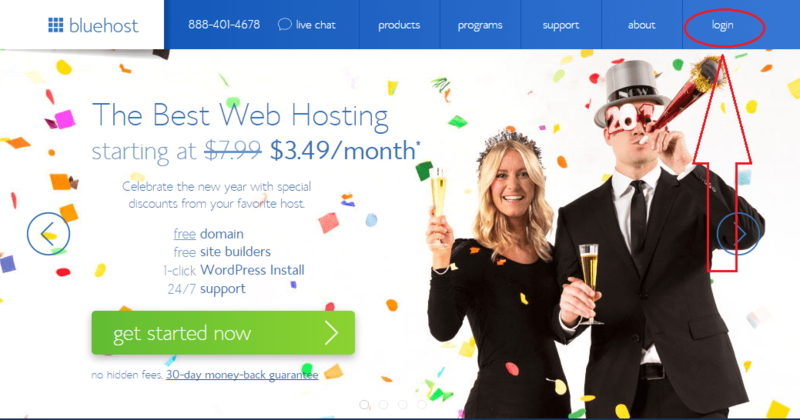 The cheapest way to create a WordPress blog is by using Bluehost as your web host. Not only is this the cheapest and most affordable to start a blog, but it’s also the most recommended. For the past 10 years, Bluehost has been the only web hosting service to be officially recommended by WordPress as the number-one recommended web hosting service. In the past I have used a number of different web hosting services and have by far had the best experience with Bluehost. Blogging has become something I’m very active in doing. It has allowed me to write and express my interests about topics I’m passionate about, and share my knowledge with others who have the same passion and interests. My blog has allowed me to stay relevant in my field by reading other blogs, writing blog post, and continuously learning about new things happening in my industry. Blogging has also forced me to learn a lot about the online world of blogging, building websites, SEO optimization, online marketing, social media, building an online presence, and so much more. I never would have been able to learn all the skills and knowledge I’ve acquired without starting a blog. You can earn money through blogging and can even make blogging a full-time career. Millions of people blog full-time for a living and make a lot more money from blogging than they ever would by working a normal job. The best part about blogging for living is that it doesn’t seem or feel like a job. Instead it’s more of a hobby that you to get compensated for by writing and creating content on topics that interest and excited you! Bloggers are able to blog from anywhere and create their own schedule. Since bloggers are not confined to a work schedule, they’re able to spend their time however they want. People that blog for a living have much more time to do things that they wouldn’t be able to do with a normal job, whether it’s traveling, exploring new places, visiting with family and friends more, meeting new people and expanding their network, or learning new skills. It’s definitely worth the small amount of money it costs to start a blog, as I’ve easily made back the money I spent on web hosting. It literally cost less than $4 a month to create a professional looking blog, and get a free website domain name by using the link I’ve provided in this post. If you really think about it, buying a cup of coffee from Starbucks or your local coffee shop cost more than that, and people buy cups coffee and espressos daily! Starting a professional looking website or blog is a very small investment that can pay big dividends. Bluehost is a highly rated web hosting company that provides top tier web hosting services for websites and blogs. They’re also the only officially recommend web hosting service recommended by WordPress and you can start your own blog with Bluehost for only $3.49 per month (this low price is only available by clicking and signing up through my link). Another benefit you’ll receive by signing up through my link is a free domain name when you purchase a hosting plan that’s 12 months or longer, saving you $15! I strongly recommend picking a hosting plan that’s 12 months or longer when you sign up with Bluehost. The longer the length the hosting plan, the larger the discount you receive → saving you money. Also, there are no hidden fees or contract commitments, which means you can cancel your service at any time or request a refund. Avoid free hosting options like Blogger and TypePad! Yes, there are free hosting options out there such as Blogger, but if you want your blog to look professional and be taken seriously, stay away from them. When you use a free hosting option you don’t have full ownership of your website or blog, and you’re limited to what you’re able to do with your blog. Also, you’ll have a very difficult time trying to establish credibility when your website URL and domain name looks something like this, mywebsitename.blogspot.com. You’re better off paying for a decent web host and having full control over what you’re able to do with your blog, and have a legitimate website URL and domain name like mywebsitename.com. If you ever plan on making money with your blog, turning it into a business, or doing freelance work then paying for a good web hosting provider like Bluehost is a must. It’s very inexpensive and you’ll even receive a free domain name. By having a blog through Bluehost, you’ll have 100% ownership and full control over what you’re able to do with your blog. For example, you’re put affiliate links and advertisements on you blog, and also customize your blog anyway you want. Affiliate programs and advertisers tend to avoid free hosting sites like Blogger, because they look cheap and untrustworthy. Serious bloggers and professionals always use self-hosted WordPress blogs, which you can receive by using web hosting services like Bluehost. To create and start setting up your blog, you’ll first need to head over to Bluehost and set up your account. By setting up an account with Bluehost, I can honestly say that you’re signing up with one of the best web hosting companies, if not the best. You’re also getting the best price! Setting up your blog! If you decided you want to get started and create your blog today, awesome! Continue reading as I go over the step-by-step process of setting up your own blog. A web hosting service provides space online for your website(s) and allows visitors to find your blog on the internet. As I stated above, you could use a free web host, but I highly recommend you use a self-hosting service like Bluehost. You’ll be much happier in the long-run and have a better experience overall. Your blog will look much more professional and attract more visitors & readers. Get Started by clicking here to go to Bluehost** (The link will open in a window so you can reference back to this guide as you work. This link also provides you with the special discount pricing & and free domain name). 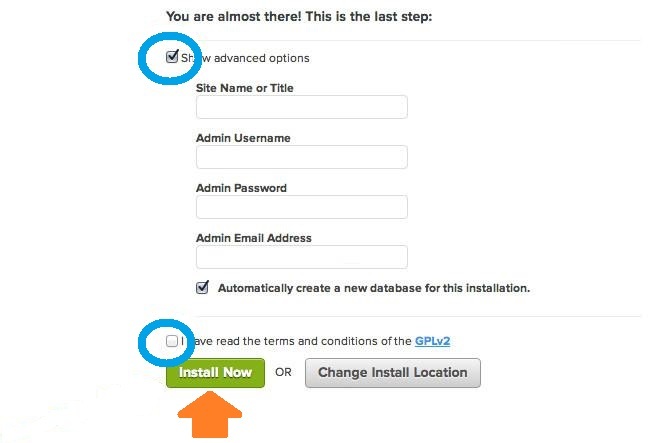 Once you’ve clicked the link and arrived at the site, click the green “get started now” button → see illustration below. Select the hosting plan you desire. 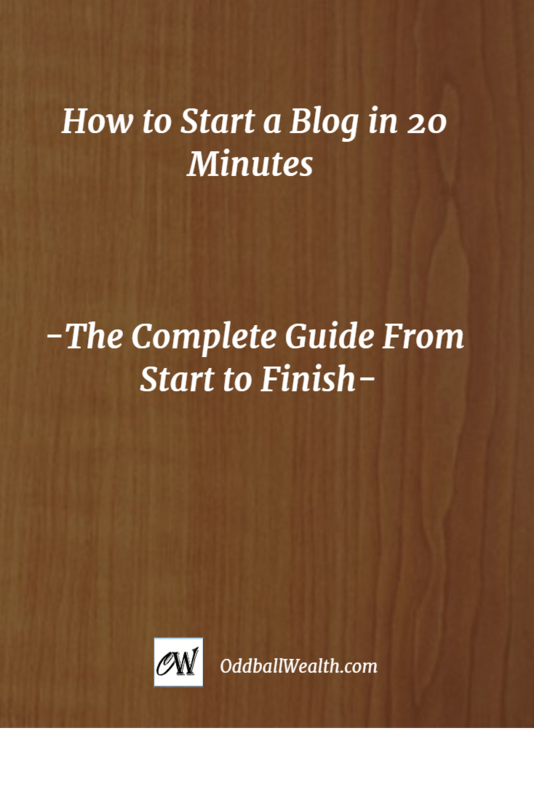 Since you’re reading this, you’re probably just starting out and only need the “basic” plan to begin, which is also the most affordable option (you can upgrade to another plan anytime). 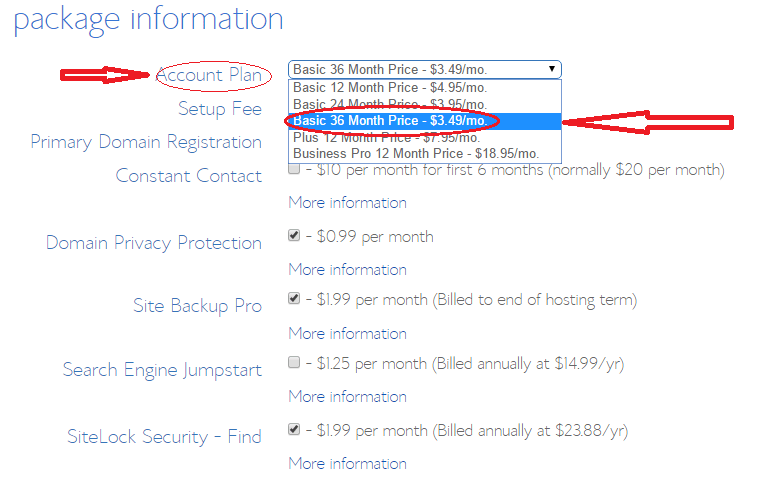 You can pick one of the more expensive hosting plans if you want, like the “plus” or “business pro”. Those plans offer a few more features than the “basic” plan. Just make sure that the plan you pick fits your blogging and website needs, so you’re not paying for more service than what you actually need. To get the special pricing of only $3.49 a month and get a FREE domain name, click the green “select” button located in the “basic” plan column → see illustration below. Select the “drop down menu” located in the “Account Plan” row. 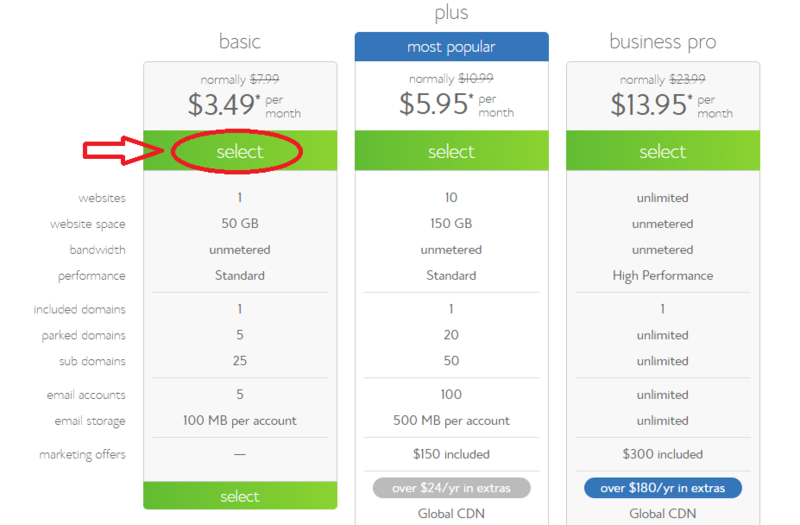 Then select “Basic 36 Month Price – $3.49/mo” → see illustration below. A domain name is your websites unique web address or “URL”, for example this blogs domain name is OddballWealth.com. Unless you already have a domain name, you’ll want to put a bit pf thought into your domain name. Choosing a domain name can be a difficult decision and it’s tough for some people to think of a domain name that fits there blogs theme. It might be a good idea to take a minute to create list of potential domain names on a piece of paper, and pick the best one. The domain name you choose should be unique and relate to your blogs topic, but try not to over think it. I can honestly say this was a tough decision for me back when I was deciding on a domain name for this blog, and I definitely over thought it. If I could go back in time, I probably would have chosen a different name. Whenever I tell people the name of my blog, I always have to repeat it back to them at least twice because people tend to have a hard time processing it correctly the first time. Normally the conversation goes like this, me: “my blog is OddballWealth.com” and the other person usually response: “Oddball.. Oddball what?”. If you don’t already have a domain name, Bluehost lets you create a domain name for your blog in this step. 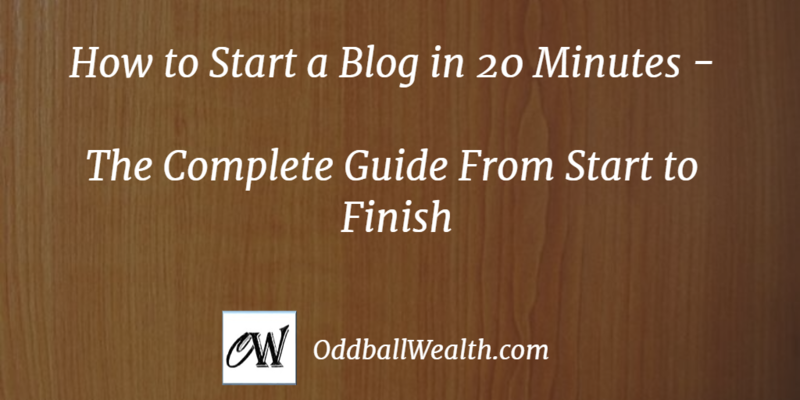 This makes the entire process of creating your blog very simple. Also, don’t forget that you can get a FREE domain name for your first year as long as you (in the previous step) picked a plan of at least 12 months or longer of web hosting through Bluehost! It’s a smart idea to pick a plan that’s at least 12 months or longer → the longer the hosting plan, the cheaper the cost of the plan. This saves you money and you get a free domain name. 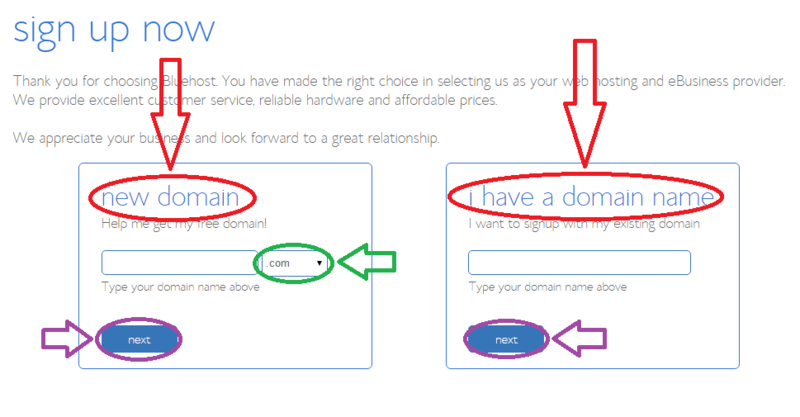 When choosing your domain name, enter it in the box on the left titled “new domain” and click the blue “next” button. Be sure the desired extension you want is selected from the “drop down menu”, such as “.com” or “.net”, etc. If you’ve already registered a domain name elsewhere, simply enter in the box on the right titled “i have a domain name” and click the blue “next” button → see illustration below. When you get to the next page, it’ll ask you to enter in your account information. Your login information will be sent to the email you provide, so be sure to use a working email address (also if you ever forget your password, Bluehost will send a link to that email address to recover it). Enter in your billing information, check the box confirming you read the fine print, then click the green “submit” button. On the next page, it’ll ask you if you want to add or purchase any upgrades. I recommend just skipping past them and continue on to completing your purchase. After you’ve finalized your purchase, you’ll want to check your email. 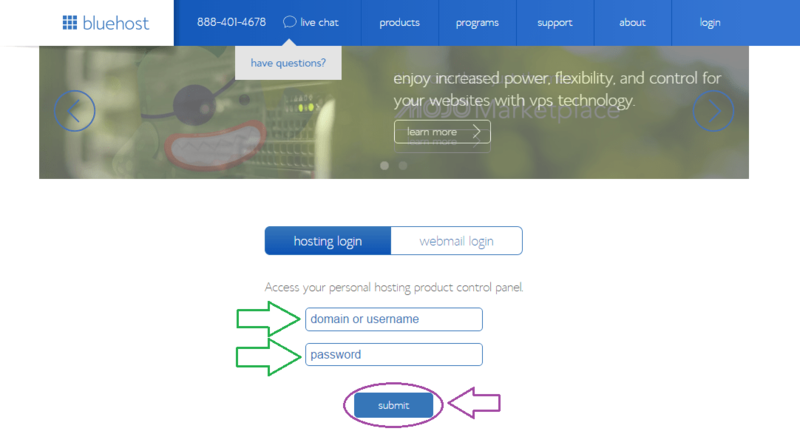 Bluehost will have sent you a welcome email and it will contain your cPanel (control panel) login information. I suggest saving this information in a desktop file, writing it down, printing it off, or doing all three of these things, so you can easily reference back to it. Next we’ll install WordPress onto your new blog! After you’ve checked your email, you can login into your cPanel in one of two ways. The first way is to go back to Bluehost and in the top right corner of the screen click the “Login” button. The second way you can login to your cPanel is by clicking the the quick link in the “Welcome” email Bluehost sent you. The “Welcome” email that was sent to you contained your cPanel login information → enter in that information on the “login Screen”, then click the blue “submit” button. Once you’re logged into your cPanel, scroll down to the section titled “MOJO Marketplace” and then click the “One-Click Install” button. Then in the top section you’ll see the section titled “Blogs”. In the Blogs section simply click the “WordPress” icon. 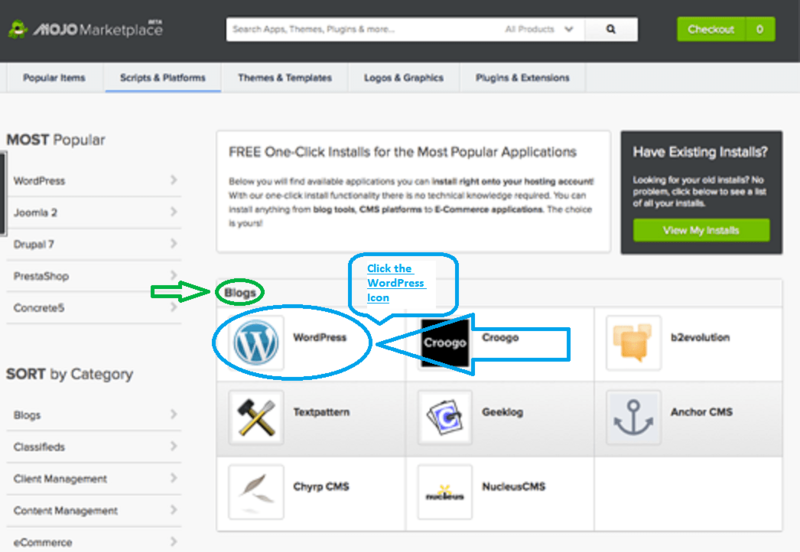 You should now be on the WordPress installation page, it should look similar to the image below. 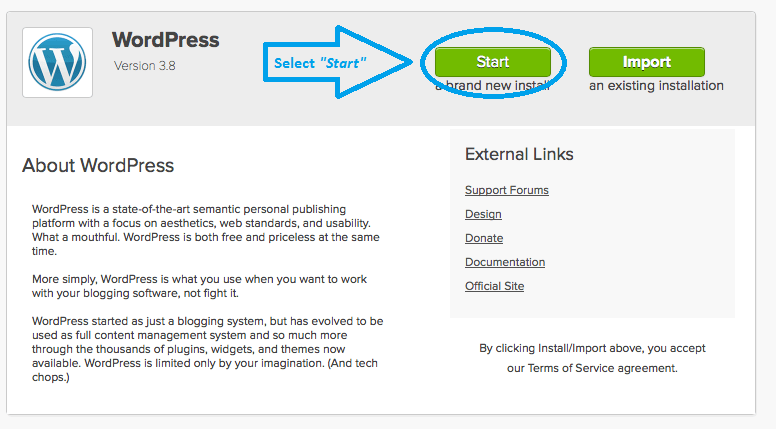 Click the green “Start” button to begin the WordPress installation process. The installation process will then guide you through a couple of simple steps. From the “drop down menu” chose the website domain name, subdomain, or a folder for one of your domains (it’s unlikely you’ll have any subdomains or subfolders if your just starting out, so just select your domain name) you want to install WordPress to. Then just click the green “Check Domain” button. Next to the “Show Advance Options”, check the box. Then type in your blogs name or title. Choose an Admin Username & Password → Hint: it’s not recommended that you use the word “admin” in your username. 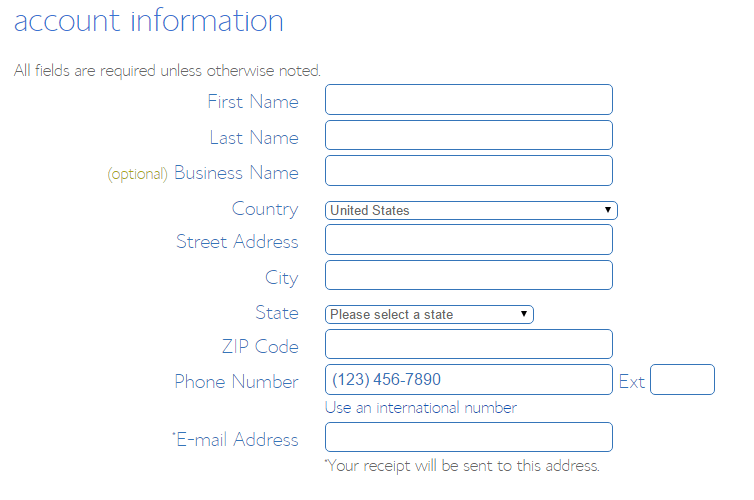 Enter in a working email, as all your information will be sent to that email address. 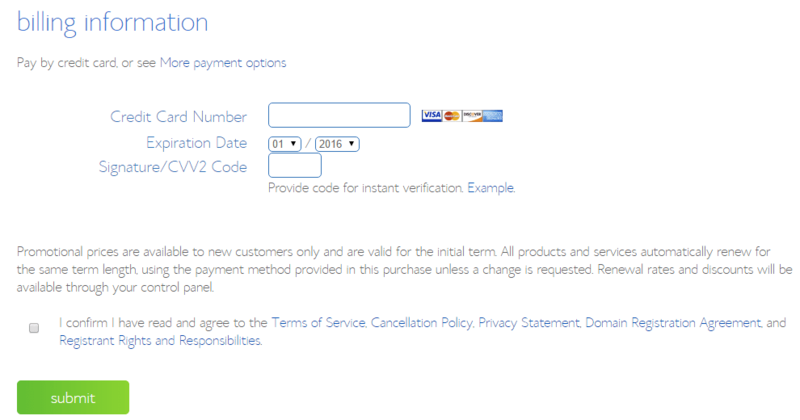 Check the box that says you have “read the terms and conditions”, and click the green “Install Now” button. The Username & Password you create is what you’ll use when logging into your blogs WordPress Dashboard. After you’ve clicked the green “Install Now” button, you’ll see a screen titled “Install Processes” or something similar. This shows you the progress for the WordPress installation until completion. When WordPress has been fully installed onto your blog, you’ll receive an “installation invoice” that will indicate your WordPress admin URL, your blogs website URL, and your WordPress admin login Username & Password. You’ll also receive and email with all the same information, except the email won’t show your WordPress admin password. You can click the quick link you received in your email (which indicated you WordPress Admin URL) and that will take you to your blogs WordPress login page, or you can type the URL in your internet browser. Whichever you choose, you’ll want to save or bookmark that page. Once you arrive to your blogs WordPress Admin login page, type in your WordPress Admin Username & Password and log in. After you’ve logged in, it should take you to your WordPress Dashboard page. From here you can create new post or page, change you blogs theme, customize your blogs layout, and so much more! 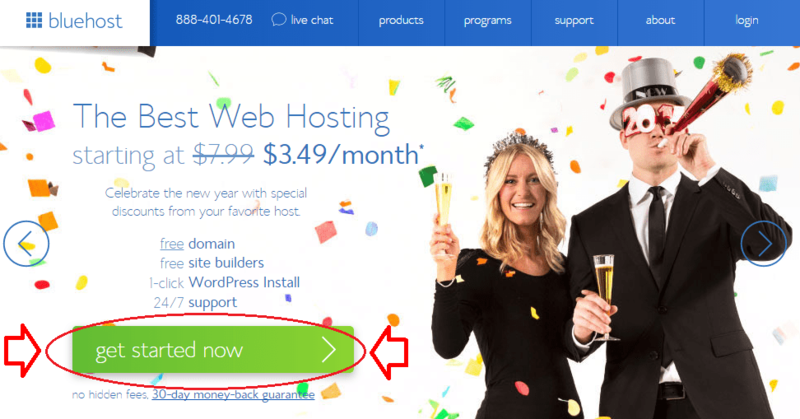 If you used an existing domain when setting up your Bluehost account that you’ve previously registered with another service like GoDaddy or NameCheap, you’ll have to redirect that domain to Bluehost’s servers. This sounds complicate but it’s actually really simple and only takes a minute to do! Bluehost has a tutorial that does a good job explaining how to do this, which you can find by clicking here. For example, if you previously registered your domain name with GoDaddy. Login to your account. Then from the My Account list or the Domain name drop down menu select, “Manage My Domains”. Next, you’ll want to select the domain name that you want to point to Bluehost. Once you select the domain name, it’ll take you to a page called “Domain Details”. Scroll down to the section titled “Nameservers”. Then click “Save Changes”. It can take up to 48 hours for these changes to take effect, but generally it takes less than an hour from my experience.